Calculators are indispensable tools in our day-to-day activities. Whether you are getting ready for an exam or figuring out profit for your business, you will always need to use a calculator. The desktop calculator still finds its way into modernity. Although it’s larger than most advanced calculators you can’t miss it in offices and business places where quick math is essential. In this post, we are all about desktop calculators. We’ll be reviewing the top five most popular desktop calculators in the market. But before we delve in, it’s always essential that you get your reasons for getting a desktop calculator straight. After all, you can buy a more advanced calculator and still get the same functionality. 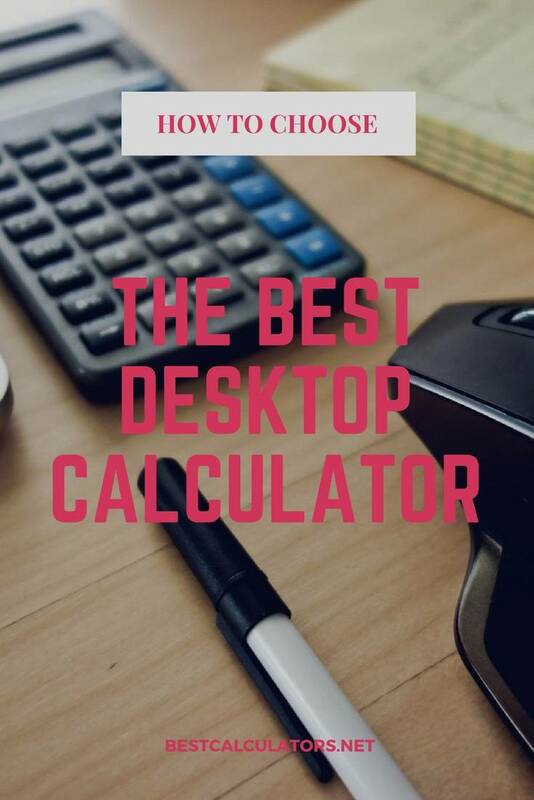 If you have no use for graphs and all you need is a model that can perform quick math, then the best desktop calculator 2019 is a good pick. Which among the brands in the market will suit you best? Let’s look into these models and find out. What is the Best Desktop Calculator in April, 2019? 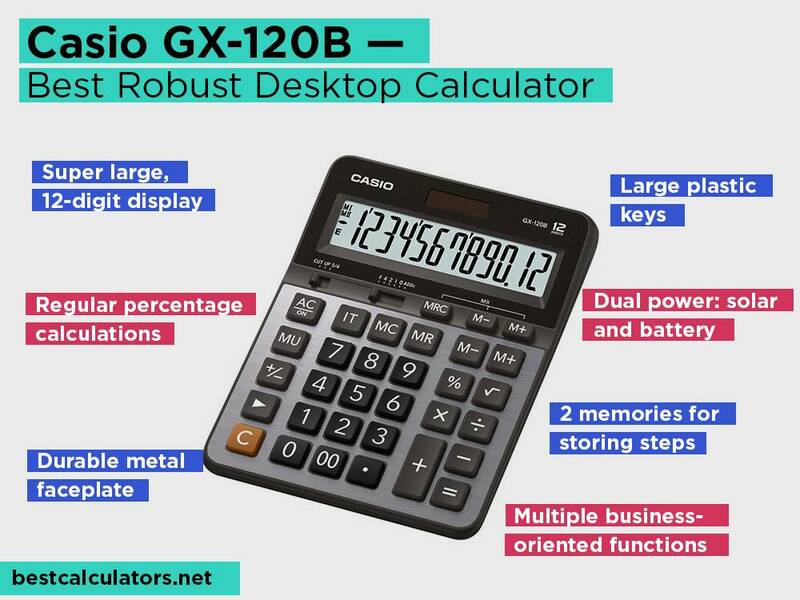 Casio GX-120B – Best Robust Desktop Calculator — Editor’s Choice! Casio GX-120B 12-digit angled display Plastic keys on well-spaced keyboard Two memories, cost, and profit margin, square root, and percent Solar with battery backup ⭐️⭐️⭐️⭐️⭐️ Check our Review! 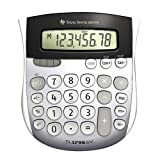 Texas Instruments TI-1795 SV 8-digit angled display Well-spaced color-coded keys Tax, profit margin, rate, square root, etc Solar with battery backup ⭐️⭐️⭐️⭐️⭐️ Check our Review! Helect H1001C 12-digit angled display Hard keys with a click sound Tax, profit, margin, memory, and key rollover Solar with battery backup ⭐️⭐️⭐️⭐️ Check our Review! Canon HS-1200TS 12-digit angled display Color-coded keys with PC-like feel Tax, profit margin, and memory Solar with battery backup ⭐️⭐️⭐️⭐️⭐️ Check our Review! 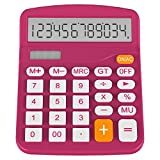 Sharp EL339HB 12-digit, angled, LCD Color-coded plastic keys 4-key independent memory, selectable decimal, rounding switches, cost/sell/margin, and percent Solar with battery backup ⭐️⭐️⭐️⭐️ Check our Review! With a metal faceplate and sturdy plastic keys, the Casio GX-120B is the ideal pick when looking for a model that will last a decent period. This calculator is designed to appeal to business owners and if you work in an office. Sometimes you need to complement office Excel since you can’t continuously work with a half Window when you need to perform quick math. The processing speed on this calculator remains one of the fastest when you want speedy answers. It is important in a busy office where every minute counts. It facilitates high-speed input using the key rollover as it buffers key operations to ensure that nothing is lost. This means you can complete tasks without errors thus deadlines will be met with less stress. What’s more, it includes markup calculations for simplified cost and profit calculations. You will no longer be guessing which is the right price for your products since it will offer the help you need to come up with the correct profit margin. You will also need it for regular percentage calculations when you want to input rate. As we said, this model uses a metal faceplate and plastic keys. It is the kind you won’t mind taking it to a construction project since it can withstand rough handling. The plastic keys are user-friendly and easy to press. They provide fast input which gets you done on specific calculations much faster. The keys are large and well-spaced. Although they are not color-coded, you will quickly master where each key is located. This calculator will work right out of its packaging thanks to the solar panel. It draws from solar energy for its operation when light is efficient. With the backup battery power, this calculator will still perform in the dark. This calculator brings lots of usefulness to the Desktop Calculator. You have probably heard of Texas Instruments and that they are beasts in this sector. This model features a small handheld size which you can take anywhere. It is suitable if you don’t want to spend so much money just to get a desktop size calculator. In this case, you have yourself the ideal package in a mini desktop calculator. This model is at home in the office or school. It features functions that are useful in both situations. With the rate and tax keys, you can get real-life answers towards your tax obligations. This guides you in the right direction towards big financial decisions with the help of a calculator. For students, you will have access to the square root key plus the sign change (+/-) key for inputting positive and negative values. This puts you at an advantage when seeking answers to complicated math problems, more so in your mid-school years. 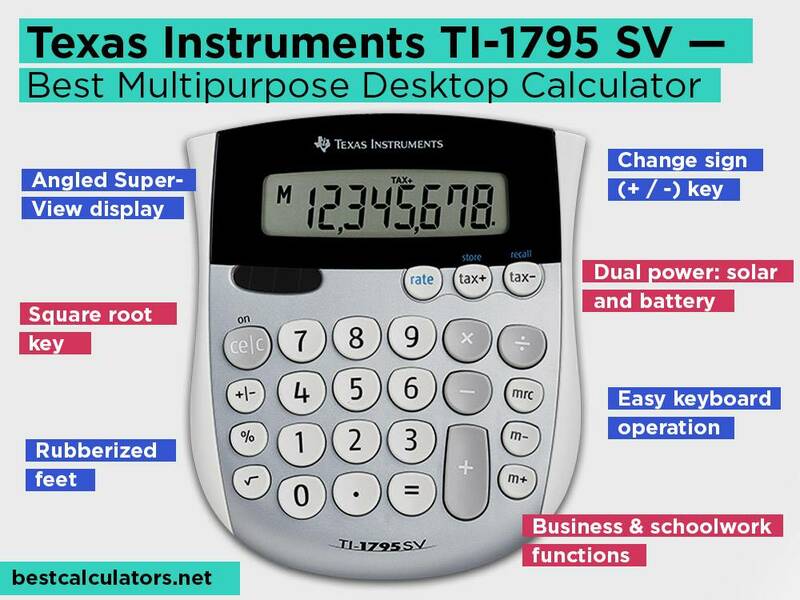 If you have ever dealt with sticky keys on a calculator, you will be happy with the Texas Instruments TI-1795. It boasts soft keys which are well-labeled, and they are color-coded in white and grey. It provides fast input of values allowing you to perform repeat calculations without losing your way on the keyboard. It helps you master the different keys so that with time your input speed increases and the errors become even less. This calculator comes in a small size such that you are not limited to the places you can put it. You can place it where space is limited or squeeze it in your bag. Not that you will have any complaints regarding the display. It also has an angled display with an 8-digit superView. It will not be any fuss keying in values and reading answers of the results. Not to mention, it has rubberized feet that prevent constant movement when keying in. If you want a calculator that doubles up as schoolwork assistant, this model is all you need. 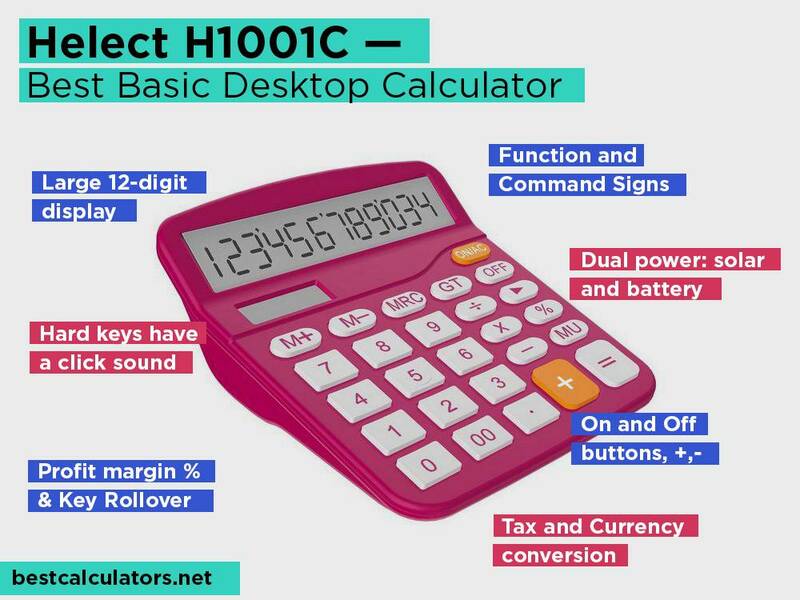 In case you wish to have a modern calculator in a colorful design, you should consider investing in Helect H1001C. This model is available in not only plum but also blue, black, orange, and white. You get to match it with other office items or your bag when taking it to a business meeting. Even with that tiny detail, this model remains solid in its performance. You may not get to calculate complex accounting problems, but this model comes in handy for daily math. It will be useful in the workplace as it is on the field. It has a memory function that helps to save steps. This saves you time when performing a series of problems since you can quickly key in the saved step and proceed without keying in that particular step. It also has a profit margin key plus tax and currency conversion functions. It allows you to proceed with essential business math for the daily running of your business. This calculator comes with a wide-angled display. It gives 12 digits meaning it is suitable for lengthy calculations or where you need decimal numbers without rounding off to the fourth place and so on. It allows intuitive interaction with the keyboard since it uses hard keys with a click so that you will know when you make a particular input. It minimizes errors since there will be a clear indication when you press a number. This unit features a slim construction. It feels premium in the hands as it weighs only 5 ounces. It will sit elegantly in any office and thanks to the rubberized feet; it will always be stable on whichever surface. Do you want a reliable model? Helect gives you double power source from either solar energy or the battery backup. It doesn’t mean sitting in the sun for this tool to charge since it is good to go with as little energy as that from the rays that enter your office through the window in the morning or evening. Not to say it won’t work when it’s not scorching. A little sunlight goes a long way. Helect brings a product that is necessary yet it is designed thoughtfully to give you comfort when reading results and keying in values. 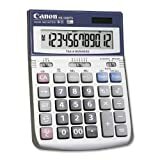 Canon is no stranger to the world of calculators. 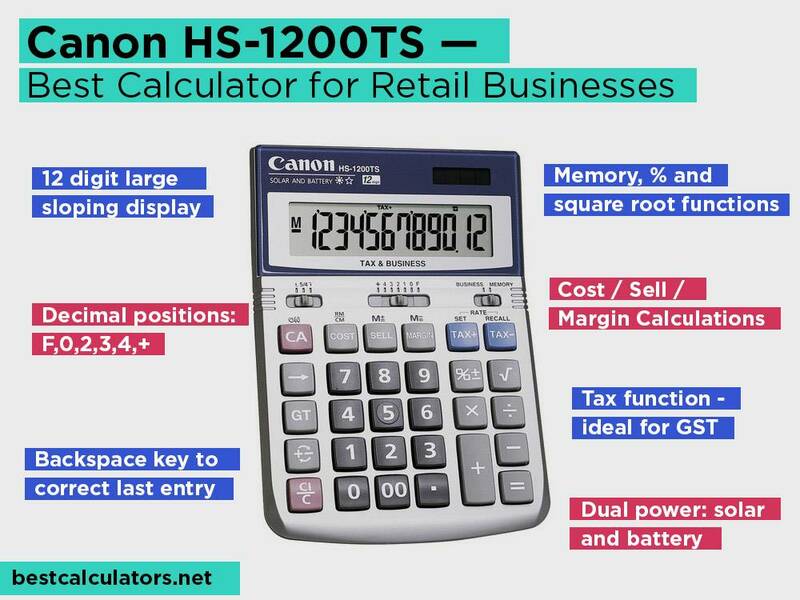 The Canon HS-1200TS is an all-purpose calculator for business. 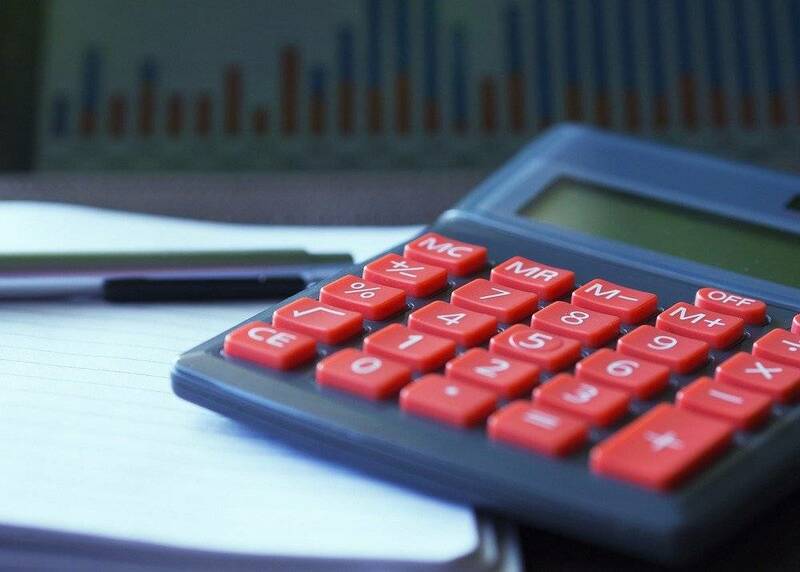 It is ideal for carrying out accounting math for your business as well as help you in running the daily tasks that require quick math. From taking account of the stock to calculating the profit margin and even taxes, this model can handle it all. Experiencing delays when a customer is standing over your head can be a frustrating experience. These are some of the disappointments you’ll never have to endure with the Canon HS-1200TS. It boats fast performance thanks to the sophisticated program it uses. With the large angled display, you get to see numbers better so that you can share input with customers and other staff. This calculator allows you to stay productive since it has many functions. It includes calculations for profit margin using the cost-sell-margin keys. It also has the tax keys where you can input a rate and just use these keys to adjust it to the current rate every day for all your business needs. The percentage key is also included to add to the functionality of this calculator. A large display complements a high-quality keyboard. You’ll be working with a display that provides a comfortable view hence minimizing eye strain. You’ll also love the PC feel of the keyboard allowing you to input numbers fast and easy. The keyboard has large contoured keys which are color-coded to prevent errors. It doesn’t matter that you may have never used a Canon calculator before. It’s going to be a breeze using this model. When you have a calculator that can use both solar and battery power, then you know you have a winner. You will never have this model dying on you in the middle of an urgent calculation. It give you control since you can use it whenever you like; whether its night or day. Overall, you have a sturdy, well-made design that is going to grace your desk and support all your calculations. 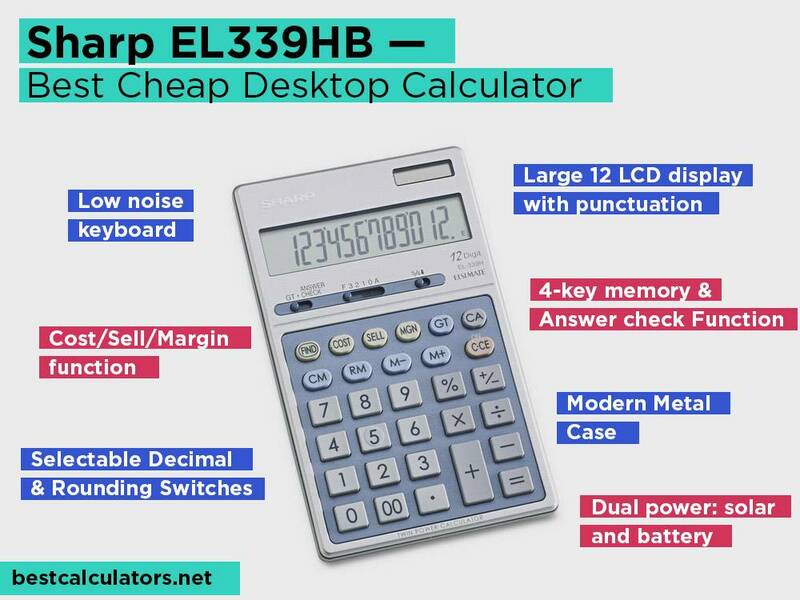 The Sharp EL339HB supports a decent range of functions for everyday math. 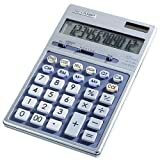 It is an incredible tool when looking for a cheap desktop calculator that does not skimp on quality and details. This model features a crystal clear LCD alongside large spaced keys for fast input. The keys are also color-coded such that you can avoid annoying errors when you are trying to master the location of keys. This calculator is practical for more than standard math calculations. It has the four memory keys which allow saving of steps. You can add different steps using the M+ key while the M- key will help erase what you store in memory. Other than that, this tool has the grand total key, sign change key for fast input of negative and positive values, cost/sell/margin, and percentage functions. It is a handy unit in accounting firms as well as busy retail shops. Sharp utilizes a robust metal case on this calculator. It provides durability in that the calculator can handle falls on rough surfaces. You can take it anywhere and not worry that it’s going to hit the ground and come back in pieces. Better still, it has a key stand which stabilizes it when you place it on your desk. With the kickstand, this unit can stay in the hihghest position as you key in values at high speed. You will like that it has a low-noise keyboard to minimize distractions when working in a quiet office. You will find it super easy to input the numbers thanks to the plastic keys. They have a springy feel which allows you feel when you press down a button. The display is also angled meaning you will not be squinting the eyes or raising your head to read the results. Like the other desktop calculators, this model also explores dual power. It primarily uses solar energy while a battery provides backup power in low-lit environments. This calculator does not, however, have a backlit display. It means you will have to bring a source of light when operating in dark conditions. 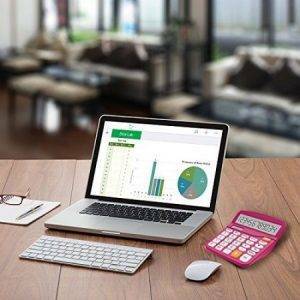 This is an all-around business calculator that is perfect for home or office. A desktop calculator helps with your daily math tasks. It is, therefore, imperative that you get the best that money can buy. But the market makes it hard to choose a calculator thanks to the many models available. This guide will help you figure out some aspects in a desktop calculator as you pick a new one or replace an old model. Without the many functions used in higher learning, you have a calculator with only the standard functions. They handle basic math in the most simplified manner. All you need is key-in a value, input a sign and hit the total to get your answer. No one needs time mastering the functions. They are all there at your fingertips. When you have a calculator, you can calculate and allocate a number to something with financial meaning. Talk of the cost of something, taxes payable, profits made. It would be a lengthy process of paper and pen when you can just punch in numbers and get the result you want. You may not be the best in math class or your accounting firm. But getting the right answers counts in both situations. A calculator helps to get those numbers right so that you can be at par with others or you can perform better both in class and in business. These calculators give solutions in microseconds. They have super-quick processors which we cannot match to our brains. If you have a lengthy work project, you may never make it to the deadline without a calculator. That’s why we all need these tools to ease the process and the stress associated with manual calculations. When you are used to keying numbers and getting results in seconds, you tend to over-rely on the calculator such that you will be super slow doing the math in your head. You will be second-guessing your answers, which then draws you to verify the answers on a calculator. It’s always important to strike a balance when using these gadgets. Which Display is better on a Desktop Calculator? This question is regarding the number representation which can be LED or LCD. LED displays emit light when power is applied, but LCD offer passive screens as they do not emit light. You will rarely encounter an LED desktop calculator since they are costly to manufacture. On the other hand, LCDs can use solar power or battery power for years which means they don’t need additional power to function. They are therefore better than LED calculators. Which display size is better on a desktop Calculator? Most desktop calculators offer a 12-digit display. It is common as it provides calculations of large numbers and decimal places do not have to be rounded to very few places. You may also encounter 8-digit and 10-digit displays. It comes down to your preference and the kind of math you wish to solve. Which is the best brand of desktop calculators? There are several desktop calculator brands all targeting the same audiences. These brands include Casio, Canon, Sharp, and Texas Instruments whose calculators we have reviewed here. These are brands which are still major producers of desktop calculators. Buying from these brands assures you of trust and longevity of their products. Choosing a desktop calculator can be a complicated process. But with the models on our list, we hope your search comes to an end. These desktop calculators are from the best brands in the market. You can expect fast processing speeds, durable designs, simplified input processes, and affordable prices. Now you can start having an easy day solving quick math with our desktop calculators.